This election was the most crucial in modern American history. It was not primarily about jobs and economics, it is about national security and, to be blunt, national survival. America, and indeed the entire Western World, faces possible destruction now communist sympathizer Barack Obama is returned to office. This video is being distributed all over the United States. Please watch it, and if you agree with the basic ideas expressed, send it out through your networks, to as many people as you can. The government would have us believe that because the FBI confronted Petraeus with his emails showing a pattern of inappropriate personal private behavior, he voluntarily departed his job as the country's chief spy to avoid embarrassment. The government would also have us believe that the existence of the general's relationship with Paula Broadwell, an unknown military scholar who wrote a book about him last year, was recently and inadvertently discovered by the FBI while it was conducting an investigation into an alleged threat made by Broadwell to another woman. And the government would as well have us believe that the president learned of all this at 5 p.m. on Election Day. We also know that when he was nominated to run the CIA, that nomination was preceded by a two-month FBI-conducted background check that likely would have revealed the existence of his relationship with Broadwell. The FBI agents conducting that background check surely would have seen his visitor logs while he commanded our troops and would have interviewed his military colleagues and regular visitors and those colleagues who knew him well and worked with him every day, and thus learned about his personal life. That's their job. And that information would have been reported immediately to President Obama and to the Senate Intelligence Committee, prior to Petraeus' formal nomination and prior to his Senate confirmation hearing. Petraeus told the Senate and House Intelligence Committees on September 14, 2012, that the mob attack on the U.S. consulate in Benghazi, Libya, three days earlier, was a spontaneous reaction of Libyans angered over a YouTube clip some believed insulted the prophet Muhammad. He even referred to that assault—which resulted in the murders of four Americans, now all thought to have been CIA agents—as a "flash mob." His scheduled secret testimony this week before the same congressional committees will produce a chastened, diminished Petraeus who will be confronted with a mountain of evidence contradicting his September testimony, perhaps exposing him to charges of perjury or lying to Congress and causing substantial embarrassment to the president. It's obvious that someone was out to silence Petraeus. Who could believe the government version of all this? The same government that wants us to believe that FBI agents innocently and accidentally discovered the Petraeus/Broadwell affair a few months ago and confronted Petraeus with his emails a few weeks ago is a cauldron of petty jealousies. From the time of its creation in 1947, the CIA has been a bitter rival of the FBI. The two agencies are both equipped with lethal force, they both often operate outside the law, and they are each seriously potent entities. 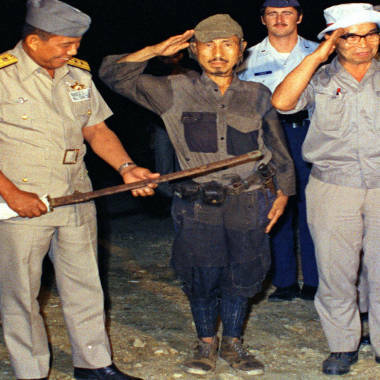 Their rivalry was tempered by federal laws that until 2001 kept the CIA from operating in the U.S. and the FBI from operating outside the U.S. Isn't it odd that FBI agents would be reading the emails of the CIA director to his mistress and that the director of the FBI, who briefs the president weekly, did not make the president aware of this? The FBI could only lawfully spy on Petraeus by the use of a search warrant, and it could only get a search warrant if its agents persuaded a federal judge that Petraeus himself—not his mistress—was involved in criminal behavior under federal law. All this—the FBI spying on the CIA—constitutes the government attacking itself. Anyone who did this when neither federal criminal law nor national security has been implicated and kept the president in the dark has violated about four federal statutes and should be fired and indicted. The general may be a cad and a bad husband, but he has the same constitutional rights as the rest of us. No keen observer could believe the government's Pollyanna version of these events. When did the CIA become a paragon of honesty? When did the FBI become a paragon of transparency? When did the government become a paragon of telling the truth? Will Petraeus drop Benghazi bombshell? PALM BEACH, Fla. – With some speculating that former CIA Director David Petraeus may be under a blackmail threat from the Obama administration, radio giant Rush Limbaugh is not expecting the general to contradict his testimony about the attack on the U.S. consulate in Benghazi when he testifies before Congress this week. A June 23, 2011, file photo shows Paula Broadwell, second from left, watching as Gen. David Petraeus and his wife, Holly Petraeus arrive for a Senate Select Intelligence Committee hearing on Petraeus' nomination to be director of the Central Intelligence Agency. What began with David Petraeus’ surprise resignation as CIA director on Friday resulting from an extramarital affair has now spiraled into a complicated story of infidelity, intrigue and politics. Petraeus’ admission of an extramarital affair quickly led to his biographer, Paula Broadwell, and an examination of her relationship with the decorated war hero. The length of the FBI’s investigation of “menacing” emails sent to Petraeus’ family friend Jill Kelley, and the timing of the announcement of his departure from the Obama administration fueled conspiracy theories. 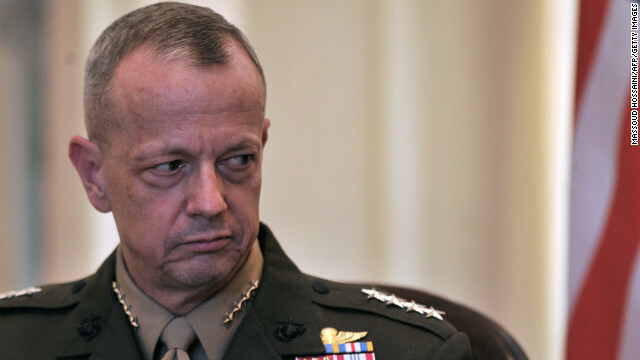 Then Gen. John Allen, Petraeus’ successor as military commander in Afghanistan, was embroiled in the scandal, accused by U.S. officials of sending “inappropriate” emails to Kelley. Spring 2006 -- Paula Broadwell meets Gen. David Petraeus, when she introduces herself after he gave a speech at Harvard's Kennedy School, where Broadwell was working on a master's degree, the Wall Street Journal reported. October 2008 -- Petraeus takes over as head of U.S. Central Command, based at MacDill Air Force Base. While serving there, he reportedly meets Jill Kelley and her husband, Dr. Scott Kelley. She is described in various accounts as a volunteer “social liaison” between the community and the base. 2008 -- Broadwell begins her doctoral dissertation, "a case study of General Petraeus’ leadership," according to Rolling Stone magazine. June 2009 -- Broadwell and her husband, Scott, purchase a home in Charlotte, N.C., the Charlotte Observer reports. June 2010 -- Petraeus is named as replacement for Gen. Stanley McChrystal as the top commander in Afghanistan after the latter makes impolitic remarks to a Rolling Stone reporter. Broadwell decides to turn her dissertation into a book. Aug. 31, 2011 -- Petraeus retires from the U.S. Army, departs Afghanistan. Sept. 6, 2011 -- Petraeus takes over as director of the CIA. Steven Boylan, a former spokesman for Gen. David Petraeus, discusses how the affair with biographer Paula Broadwell started, saying the general is "embarrassed and keenly aware of the hurt and pain he's caused." Early November 2011 – According to former Petraeus spokesman Steve Boylan, who had spoken to his former boss after his resignation, Petraeus' affair with Broadwell began around this time, approximately two months after he took the CIA job. January 2012 – “All In, The Education of General David Petraeus,” by Paula Broadwell with Vernon Loeb is published by Penguin Press. May 2012 – “Menacing” emails – five to 10 of them, according to the Wall Street Journal -- began arriving in Jill Kelley's inbox, NBC’s Michael Isikoff and Pete Williams report. Paula Broadwell is pictured before embarking on a national book tour to promote "All In," her biography of Gen. David Petraeus. June 2012 – The FBI investigation begins. A source close to Kelley tells Isikoff that she took the emails, which she viewed as harassing or menacing, to the FBI. The source said the anonymous emails didn’t mention Petraeus by name, but subsequent emails – sent from multiple alias accounts -- contained references to the "comings and goings" of high-level military officials -- including events that were not on any public schedule. This raised the question as to whether somebody had access to sensitive -- and classified -- information about the CIA director. Late summer -- Attorney General Eric Holder is told that agents have discovered an email link between Petraeus and Broadwell, which included exchange of “explicit details of a sexual nature,” according to the Wall Street Journal. September – FBI agents interview Paula Broadwell for first time, NBC’s Pete Williams reports. Oct. 27 -- House Majority Leader Eric Cantor speaks to an FBI agent who had worked on the Petraeus investigation, according to Cantor spokesman Doug Heye. The agent-- who had originally contacted Rep. Dave Reichert, a Republican from Washington -- raised concerns that "sensitive information" relating to Petraeus may have been "compromised," Heye said. The timing of the tip to Reichert is not clear. Week of Oct. 29 – FBI agents interview Petraeus and Broadwell (for a second time), according to NBC’s Michael Isikoff. Approximately Oct. 30-31 – Somewhere around this time frame, Petraeus traveled to Tripoli to conduct his own personal inquiry into Benghazi, according to author Bob Woodward, appearing on "Meet the Press" on Nov. 11. NBC’s Andrea Mitchell confirmed that Petraeus had recently traveled to Libya. NBC's Andrea Mitchell and the Washington Post's Bob Woodward visit Meet the Press to examine the fallout from CIA chief David Petraeus' extramarital affair. Oct. 31 – After conferring with his chief of staff, Steve Stombres, and Richard Cullen, a former attorney general of Virginia, Cantor had Stombres call the FBI chief of staff to relay the information he had received from the FBI agent, NBC News has reported. Nov. 1 -- Cantor aide Steve Stombres is told by the FBI that it cannot confirm or deny an investigation, but the bureau official assured the leader's office it was acting to protect national security. Nov. 2 – The FBI concludes its investigation, according to NBC News’ Michael Isikoff, citing senior U.S. law enforcement official; the last FBI interviews with both Broadwell and Petraeus also took place this day, NBC’s Pete Williams reports, citing federal officials. Nov. 6 – Justice Department informs Director of National Intelligence James Clapper. Nov. 7 – Clapper informs the White House. Nov. 8 – Petraeus calls White House Deputy Chief of Staff Thomas Donilon and asks to see the president, NBC’s Andrea Mitchell reports. The White House tells Obama of the FBI investigation of Petraeus and his admission of an extramarital affair. 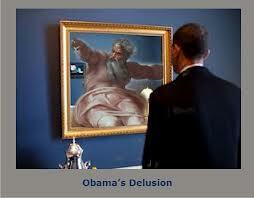 Nov. 9 – Obama accepts Petraeus’ resignation; Senate and House leaders first learn of it from media calls. They then speak to Petraeus, but don’t hear directly from the president, Mitchell reported. Nov. 11 – Jill Kelley and her husband, Scott, issue statement: "We and our family have been friends with Gen. Petraeus and his family for over five years. We respect his and his family's privacy and want the same for us and our three children." Nov. 12 – In a surprise statement during a trip to Australia, Defense Secretary Leon Panetta announces that U.S. General John Allen, who succeeded Petraeus as military commander in Afghanistan, is under investigation over allegations he exchanged “inappropriate” emails with Kelley, the woman who triggered the investigation of Petraeus. Meanwhile, FBI agents carry out a four-hour “consensual search” of Broadwell’s home in Charlotte, N.C., leaving with eight to 10 cardboard boxes. Updated 4 p.m. ET: Allegedly “inappropriate” emails between U.S. Gen. John Allen and the woman who sparked the investigation into CIA Director David Petraeus do not signify the two had an affair, a defense official told NBC News on Tuesday. “There was no affair,” said the official, who spoke on condition of anonymity. The emails in question could be misconstrued, the official said, predicting that the investigation will prove Allen’s innocence. Allen, the commander of the International Security Assistance Force in Afghanistan, is under investigation over allegations that he exchanged “inappropriate” emails with Jill Kelley, a senior defense official told reporters earlier Tuesday. A difference of opinion appeared to be brewing at the Pentagon about how to characterize the emails, with another official calling them flirtatious. Kelley, a Tampa, Fla., woman who has acted as a volunteer “social liaison” with military officials at MacDill Air Force Base, inadvertently launched the investigation that led to Petraeus’ resignation by complaining to the FBI about anonymous emails she received. FBI agents traced the allegedly threatening emails to Paula Broadwell, Petraeus' biographer. During the investigation, agents discovered emails between Petraeus and Broadwell that were indicative of an extramarital affair between them, according to government and law enforcement officials. Petraeus, who was appointed 14 months ago to head the Central Intelligence Agency, announced his resignation on Friday, citing an extramarital affair. Word of the investigation into Gen. Allen’s involvement came early Tuesday, when U.S. Secretary of Defense Leon Panetta issued a statement during a flight to Australia for a meeting with defense officials there, saying that the FBI had referred “a matter involving" Allen to the Department of Defense's Inspector General. New in this version: FBI search Paula Broadwell's home Monday night; officials say the FBI agent who worked with Jill Kelley, the Tampa, Fla. woman who received anonymous emails from Broadwell, was dismissed from case because he became obsessed with Kelley. Updated at 11:36 p.m. ET: “Menacing” anonymous emails that launched the FBI investigation which ultimately brought down CIA Director David Petraeus contained references to the “comings and goings” of high-level U.S. military officials, raising concerns that someone had improperly gained access to sensitive and classified information, a source close to the recipient tells NBC News. The first email sent anonymously to Jill Kelley, the Tampa, Fla., woman who reported the threatening emails to the FBI, in May referred to Kelley socializing with other generals in the Tampa area and suggested it was inappropriate and should stop, according to the source close to Kelley, who spoke with NBC News on condition of anonymity. After Kelley alerted the FBI, agents began pursuing it as a possible case of cyber harassment or stalking. "The thought was she was being followed," the source said. The anonymous emails continued -- sent from multiple alias accounts -- and some later ones in the sequence contained references to Petraeus, though not by name, the source said. What most alarmed Kelley and the FBI, the source said, were references to "the comings and goings" of high-level generals from the U.S. Central Command, which is based at MacDill Air Force Base in Tampa, and the U.S. Southern Command, as well as Petraeus -- including events that were not on any public schedule. This raised the question as to whether somebody had access to sensitive -- and classified -- information. Moreover, the sender of the emails had "covered her tracks pretty well," the source said. A woman walking Sunday night by the sculpture in Coronation Park — at the foot of Strachan Ave. and Lakeshore Blvd. 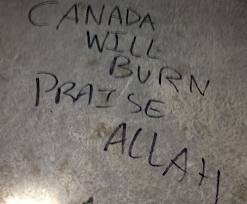 W. — called police after noticing someone had taken a black marker and written “Canada will burn; Praise Allah” on the memorial. At the Remembrance Day ceremony at Old City Hall Sunday morning, anti-war protesters were heard chanting during the two minutes of silence. Williams said he couldn’t speculate whether the vandalism was protest-related. “I can’t speculate as to what their motivation is, but if they did this on Nov. 10 or 11 … someone is looking for an opportunity to draw attention to themselves,” he said. City cleaners scrubbed the black letters off the memorial. George Murphy, 72, whose father fought in the Battle of Monte Cassino and in Normandy during the Second World War, teared up looking at the monument. 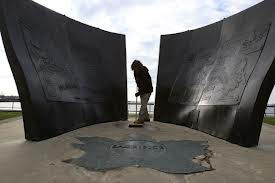 John McEwen, 67, who built the memorial in 1995, said the monument symbolizes the range of languages in Canada and recognizes the 50th anniversary of the Second World War and the military contributions of Canadians. “Do I take it personally? No, and I don’t think the veterans should take it personally,” he said. “Stupidity isn’t even politics. Stupidity is ignorance and ignorance is an indulgence in a place where you don’t know what’s going on. Mayor Rob Ford said he was sickened by the news of the war memorial being defaced. “It really, really bothers me,” Ford said at City Hall on Monday. Officers were also investigating a sign at a lifeguard’s post near the memorial, which had “Holy Jihad” written in black marker, to determine if there was any connection with the vandalism found on the memorial. Police urge anyone with information to call 416-808-1400 or Crime Stoppers at 416-222-TIPS.